Right wing intellectuals on the make will say anything. Some claim the favela should be the model for the future. Innovative and flexible, it suits fast changing modern capitalism. ‘I don’t believe it,’ said the man from BBC Panorama. He meant what he saw. There is much to shock – the living quarters in the breeze block shanty towns, the age of the crack addicts, the constant smell of excrement and sewage and the police ignoring the open child prostitution. Welcome to innovation and flexibility. The entrepreneur must not be undermined. We are told this constantly. The entrepreneurial ideas that shaped history are not remembered with the same enthusiasm. The abolition of slavery was resisted for so long because the powerful were reluctant to sacrifice a good idea, a clever wheeze. Capitalism means change, and the future, because it is always different, will redeem. Tell it to the pubescent teenagers who will be killed by their pimps if they refuse to continue with prostitution. Sao Paulo has 20 million people. 5 million live in favelas. Many of the other 15 million will welcome the FIFA World Cup, and most have survived by not thinking about the 5 million. Riots and protests have anticipated the arrival of the football extravaganza. Not all the protesters have been concerned with dealing with a favela existence that they would find unendurable. Instead, many have complained about the inadequate public sector and how it affects, no prizes for guessing, the 15 million. In the 5 million the exceptionally strong will survive the experience. Some will eventually join the middle class. Most of the exceptionally strong, though, become drug dealers and control the favelas. Welcome to innovation and flexibility. This is why the rich believe in public schools and inherited wealth. Lines have to be drawn between the rich and poor. Not every policeman wants to oppress the poor but maintaining demarcation is a priority for the police strategists. No one can deny the job is difficult for those on the street. It is why brutes are useful. As the gap between rich and poor widens, the brutality becomes important. We give the police bigger guns. Slums are the symbols of the grass topped slag heap societies that modern capitalism produces. The human race escaped the caves by working together. Then the brigands took over, and here we are today. The sensitive rich of Brazil use helicopters, a great invention that makes sure your feet will never get dirty. The rich fly by the mess they created. Meanwhile, the British press are concerned that football millionaires in air conditioned luxury hotels will stare through windows at the slums that contain so many broken lives. Residents of favelas are not described as human beings but as an infection. 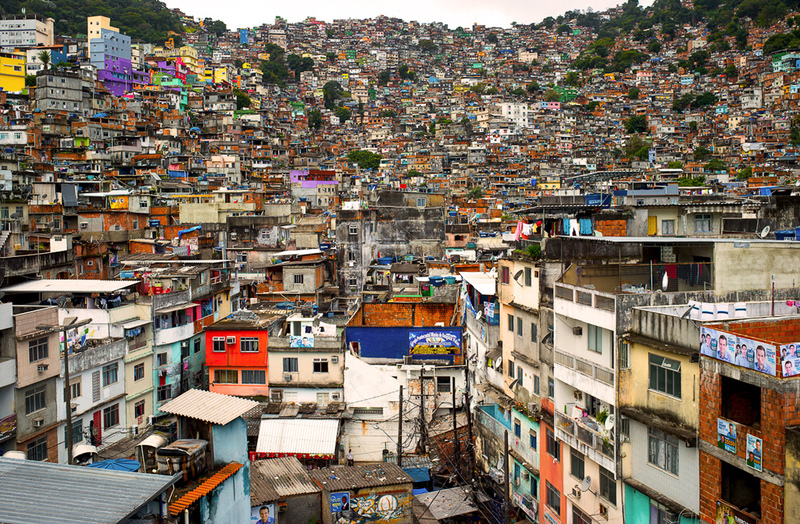 What is ignored is the ideological infection that produces absurdities like favelas. The belief that all that matters is making money and only that will produce well-being and prosperity. It produces chaos, and we call it innovation and flexibility. Posted in Brazil, Horror, News, Travel and tagged Brazil, favelas, football, politics, world cup on June 8, 2014 by Howard Jackson.